For information on the RVCC program contact Brian Duff at . That’s the cost of a fine for not having the required safety equipment in good working order on your boat. Let CPS-ECP volunteers help you beat the odds. 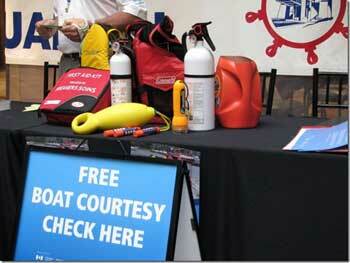 We will check your boat for free… and if you have everything you need, you’ll get a Safety Inspection Sticker*. If you don’t have everything, we will explain exactly what you should have on board so you can be sure to win that bet… penalty free! The RVCC (Recreational Vessel Courtesy Check) is in partnership with Transport Canada. CPS-ECP and your local Peterborough Squadron wants to lead the way. The check itself takes approximately 15 to 30 minutes and consists of a visual check of safety equipment (personal, fire, signalling and navigational) according to size of boat and the DOT's small vessel regulations. A two-part form is filled out, one part for the boater and the other for Transport Canada. If the vessel being inspected is fully in compliance with the safe boating regulations a windshield sticker is awarded. This is an annual check so the stickers are marked with the year they are issued. If the vessel is non compliant the owner will be given an opportunity to return with his part of the form and evidence that he is now compliant, at which time we will re-inspect that portion of his safety equipment and issue a sticker.